**Order by 12:00 noon. Depending upon Options. EZ roof have a solution for bonding insulation without the need for heat and flames in roofing applications. The solution is a two part polyurethane adhesive which not only bonds the insulation but, as it does not contains volatile solvents, it meets environmental standards. The adhesive comes in handy jumbo cartridges for simple and easy use. Once applied the adhesive reacts to form a permanent polyurethane bond with excellent adhesion and flexibility even at very low temperatures. It is suitable for bonding insulation to timber, concrete, steel, or to existing roof deck. 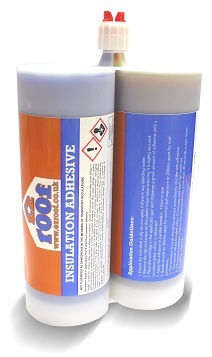 The adhesive foams to tolerate uneven roof decks, including laps in roofing membranes. However, the low density foam will not cause any lifting of the board or the need for weighing down boards.